Wendy's 3-D Cats: 3-D CATS IN HATS ON A SUNNY SUNDAY! The 3-Ds are so happy that sunnier days are here! This is reflected in their choice of hats and accoutrements. 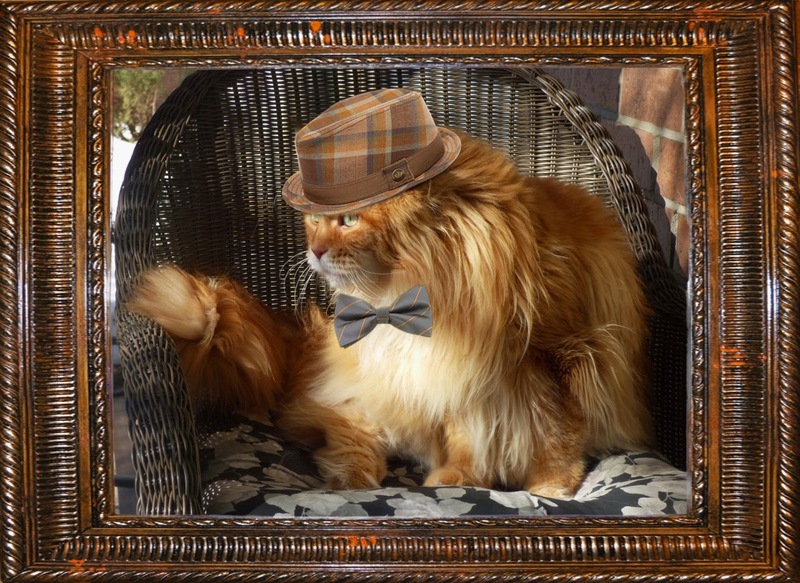 Dante has chosen an orange, brown and gray plaid pork-pie hat and has paired it with a gray and apricot-striped bowtie. He's glad he doesn't need to wear a woolly scarf any more. His native fur coat doesn't seeming to be thinning quite yet though, so he's anxious to discard some of that, as well. "Anywun need sum wool? ", asks he. 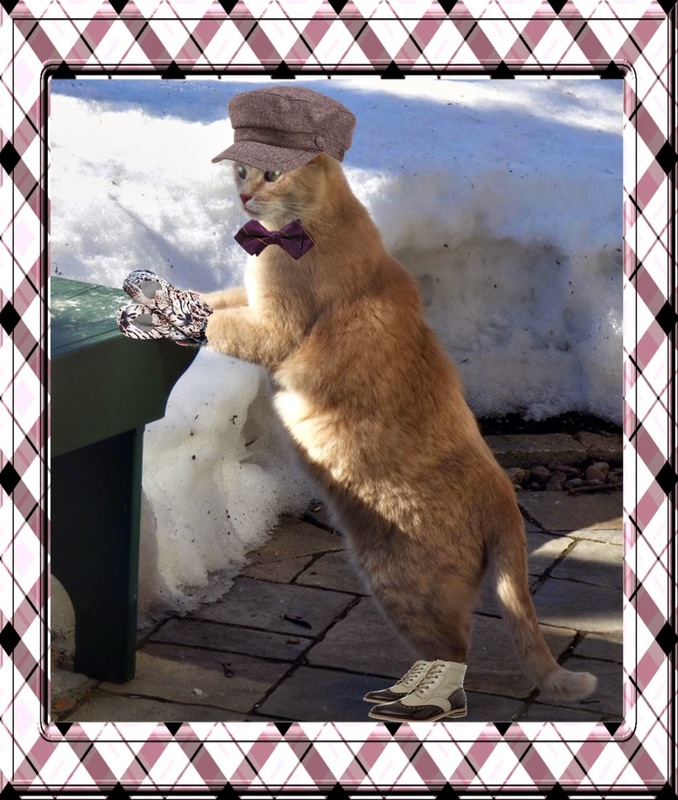 Dylan's sporting spats (no less) on his toesies and a plum herringbone tweed captain's hat on his head, which he has coordinated with a similarly-toned and striped bowtie. He also wanted to keep his front paws covered and has selected some leopard-print mittens which are apparently doing the trick. "I'm jus' plum tired a wintah" declares Dylan. Domino has opted for some vibrant colour! 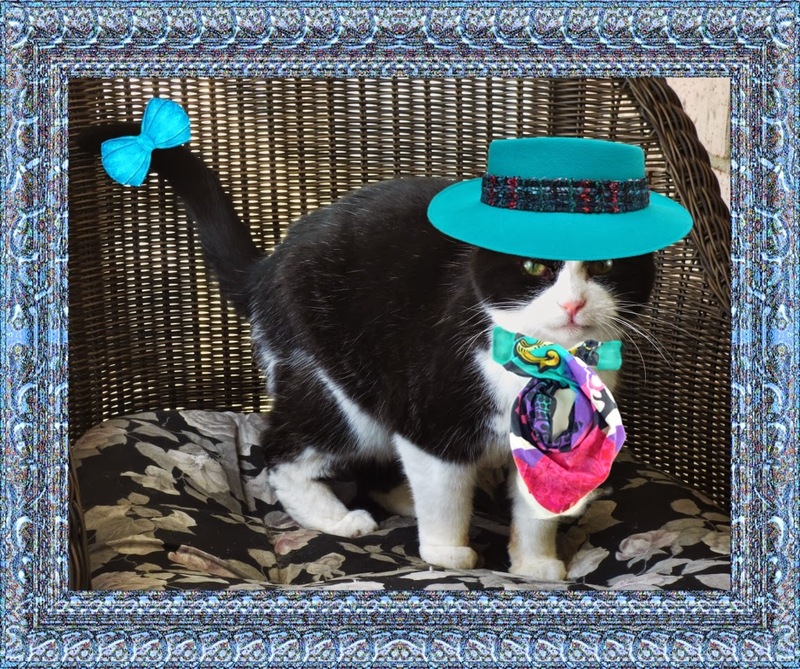 She is bored with all the dull winter tones, and has selected a bright turquoise hat with multi-coloured band, and a scarf which picks up the same hues. For an extra little flair, she has tied a turquoise ribbon around her tail. Whenever she moves it (her tail, that is), she feels very swish! "Since I doan has a coat-a-many-colours, I hasta make my own", explains Domino. So colourful cats unite! It's time to take a bite out of winter.